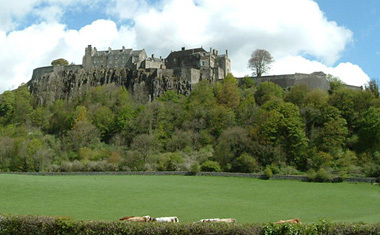 Stirling Castle is located on a volcanic outcrop near the lowest crossing point of the River Forth. The castle is described as being “like a huge brooch clasping Highlands and Lowlands together”. The castle overlooks the battle sites of Stirling Bridge (William Wallace, 1297) and Bannockburn (Robert the Bruce, 1314), in which Scotland defeated England. The original structure, which dated from around 1110, was dismantled after Bannockburn and the present castle took shape from the late C14th, with additional building until the C18th. The site is some 75m above the plain below and the castle is constructed from limestone and sandstone. Much of it was built during the reign of James IV and is in the Classical style. The oldest building in Stirling Castle is the North Gate, also known as the Mint, which dates from 1381. It serves as the ‘back door’ and connects with the curtain wall around the castle. The most important buildings in the complex are those of the Inner Close — the King’s Old Buildings (1496), the Great Hall (1503), the Royal Palace (1538-42) and the Chapel Royal (1594). The King's Old Building, or King’s House, sits on cliffs at the highest part of the rock outcrop. The two-storey structure was the monarch’s residence until the Royal Palace was built. From 1719 it was used as a garrison, with additional floors and windows being installed in the 1790s. The north end was rebuilt after a fire in 1855, and the building now contains the regimental Museum of the Argyll and Sutherland Highlanders. The Great Hall has five fireplaces and is 42m long and 14m wide, making it the largest in Scotland. It had an oak hammer beam roof, wall walks, interior galleries and leaded windows. Modifications to the Great Hall for military use included the insertion of extra floors (one in 1711-14 and a further two in 1796-99) and walls (1796-99), and barrack rooms. Military use ceased at Stirling Castle in 1964, and the hall was restored its former glory in 1999 — including rendering and limewashing the exterior. It was reopened by HM Queen Elizabeth II on 30th November 1999. The Royal Palace is the finest Renaissance building in Scotland. It was built around a paved quadrangle and its ornate three-storey façade had tall windows and sculpture-filled niches. The interior had six main rooms. The palace was converted into military quarters in the C18th. In 2005, work began to restore the building to its C16th appearance. Included in the £12 million contract is the restoration of the King's Presence Chamber, which has a ceiling carved with more than 100 oak heads. In the Outer Close are the Great Kitchens (early C16th) and army buildings. The Grand Battery was built over the kitchens circa 1689, but were excavated and restored in 1921. The Forework Gatehouse (1501-06) and Outer Defences (1714) surround the gardens and guard the main entrance from town. Originally the gatehouse had six tower topped by conical roofs, although only a pair of truncated towers remain. There are vaulted chambers, called casemates, set into the walls to provide secure accommodation when under attack. The Nether Bailey and its powder magazines (three in 1810 and one more in 1860) occupy the lower part of the rock outcrop. In 1543, the nine-month old Mary Queen of Scots was crowned in the castle’s chapel. Her son, the future King James VI, was baptised here in 1566 — celebrations included the first firework display in Scotland. Queen Victoria visited the castle in 1849 and declared it “extremely grand”. The castle is maintained by Historic Scotland and is open daily, with the exception of the Royal Palace, which will reopen in March 2011.